Who do you want to entrust with your Internet market share and business growth? As I tell you throughout this website, Search Engine Optimization is a subset of Internet Marketing. It's a business decision based on ROI. You will find SEO services ranging from less than $200 to optimize you entire website to Search Engine Optimization Services costing six figures or more in places like New York. Of course there are scope considerations. However, I urge you to use common sense. Anyone who has these Internet Marketing skills is not working for minimum wage simply because the knowledge is worth thousands or millions of dollars to the bottom line. or Call Me at 610-334-7463. Ask for a Live SEO Presentation on your Desktop or Notebook Computer. There are many characteristics of low-quality websites. They're hard to navigate, read, and they're extremely slow. However, one of the most significant indicators of low-quality or inexperienced SEO people is content that trips all over itself in a failed attempt to seamlessly embed targeted keywords and key phrases. Read the content of your web page out loud. Does it sound right? Does it sound like something a normal human being would write? Read the content of your potential SEO Company's website out loud. How comfortable do you feel reading it? Is the content bothersome to read? That uncomfortable feeling you get is the direct result of the writer creating content for search engines and not people. Google's algorithm will usually detect and penalize the website. However, Google it doesn't always poorly-written content. Sometimes terrible websites find their way to high rankings. Most times bad sites rank well because their competitors' sites are worse. However, there are times when well-written sites rank lower than some truly awful websites. Regardless of why these sites rank well, there are more important considerations. The goal for investing in Search Engine Optimization is not simply traffic. You want sales and leads. If you're not getting new business the traffic on your website is worthless. If content sounds strained and uncomfortable to you, it just as annoying to the overwhelming majority of your potential customers. As you already know, when a site visitor becomes uncomfortable in any way they quickly leave. Furthermore, copy written for search engines insults the reader and sounds unprofessional and stupid. I don't have a statistical study to support this statement. However, I think it's safe to say the majority of people prefer not to buy products and services from unprofessional and stupid businesses. Furthermore, even if it's one of those situations where a terrible website continues to rank well, you have the opportunity to present positive, shocking contrast. Our primary goal is to have both top positions in the search engines and have exciting content. However, if you're not in first place, your visitor will have first had a bad experience before visiting your website. As previously mentioned on this page, visitors quickly navigate away from the uncomfortable content. You're the next and you're website is great. It's like your website visitor has been walking for two hours in Death Valley in 110° and then stumbles upon a resort where he or she is offered a cold iced tea and a cool dip in the pool. Many SEO Companies offering very low prices for Search Engine Optimization Services with U.S. addresses are outsourcing the SEO work overseas to keep costs low. In fact, one of the first questions you should ask an SEO provider is if they outsource work out of the country. You may also receive direct contact from SEO Firms openly based in India and elsewhere overseas. Here's why outsources SEO is a terrible idea and why it is anything but affordable. Much of the success in Search Engine Optimization involves keyword research. Keyword research requires an intimate knowledge of the language used on the website including figures of speech and local colloquialisms. For example, even if I spoke fluent Spanish, I couldn't do a good job of generating web traffic in Spain simply because I don't know the nuances of actually speaking the language. do speak English and knowledgeable regarding copy for the web which is completely different from other forms of written communication. understand your costs, profitability, and ROI because I have a BS in Accounting and an MBA in Finance... I've held management positions in these areas and successfully own and run online businesses. can effectively communicate with your Systems people because I have a successful Computer Software and Business Consulting business and I do all my coding for my online stores. can help you come up with a strategy that makes sense for your company because I have worked as a Chief Information Officer, Chief Financial Officer and Director of Budgeting for large companies. I understand that just as Search Engine Optimization is a subset of Internet marketing, Internet marketing is a subset of the overall organization. I take on a limited number of clients to help fund the working capital I need to grow my businesses. If you're interested in partnering with someone to provide Search Engine Optimization Services who understands where you're coming from and what you're trying to achieve, please contact me. Does your SEO Company also represent your competitors? I will not accept SEO clients who compete with your business. 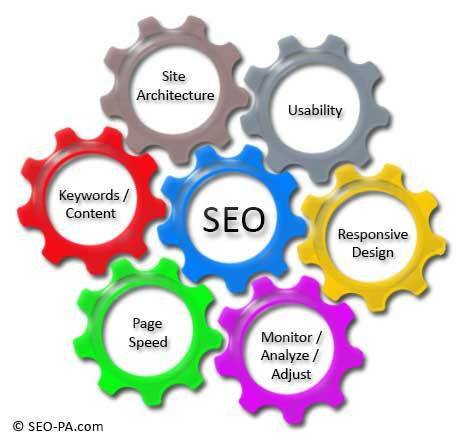 Some web SEO Services boast that they're experts in a particular industry. If they do represent more than one competing business, it's a classic conflict of interest. Representing more than one competing SEO client also raises significant privacy issues. Get the agreement in writing. lastly, offer a No Risk Full Cash Back Customer Satisfaction Guarantee. DO NOT SHARE OR SELL ANY INFORMATION. will sign whatever non-disclosure or non-compete agreements as required. won't constantly badger you with annoying junk emails. If you prefer, you can call me right now for an immediate, personalized, Live SEO Presentation on your computer.